These products are produced from the combination of high grade silicone and wire. The silicone elastomer acts as an environmental seal giving a high corrosion resistance, while the wire provides excellent conductivity to establish EMI/RFI integrity. Products are available in solid silicone or silicone sponge and a variety of wire types to suit the contact surfaces. Conductive elastomers are composed of conductive microscopic particles integrated into silicone material. When compressed, the material functions as a conductor and thereby creates EMI and environmental gasketing. A selection of grades is available with alternative metal particles to suit the specific application. Conductive O-Rings are generally specified where there is a need for an effective seal between the cover and the housing of an electrical device that is emitting a magnetic field. The O-Ring is also effective as protection of the device from any external EMI/RFI field. Once embedded in its groove, the O-ring is also an effective environmental seal. Fabric over Foams strip gaskets consist of a conductive fabric or metal foil wrapped over foam. The gasket is attached with pressure sensitive adhesive. This solution achieves good shielding effectiveness with low surface resistance and is effective for grounding, EMI shielding and as an environmental seal. The product is easy to cut to any length to facilitate installation. Pronat uniquely offers a fabric over foam strip that is effective for both EMI shielding and as an environmental seal. We achieve this result by only covering two planes of the strip with a high quality EMI fabric. The third plane has a psa strip in order to facilitate mounting for simple installation. To ensure maximum durability, a high performance silicone foam is used. Ease of opening and closing the enclosure. Low force required to achieve hermetic sealing. Microwave absorbing materials are available in varying grades, densities and thicknesses, depending on the required frequency and for specific application performance. They are utelised where there is no possibility of grounding the shielding material. Metal Foil Tapes are available in aluminum, reinforced aluminum and copper. All coated with conductive adhesive on one side. These highly conformable tapes are designed for many applications requiring moisture and chemical resistance, thermal conductivity, heat and light reflectance, flame resistance, and weatherability. Tapes with release liners for die cutting and ease of handling. 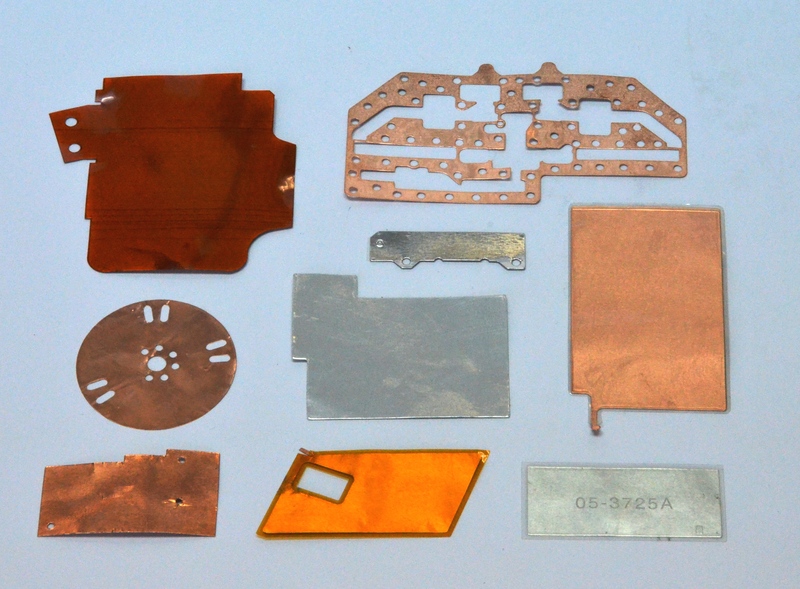 Conductive indium tin oxide (ITO) film is used to obtain an effective EMC shield on windows or front panels of electronic equipment. 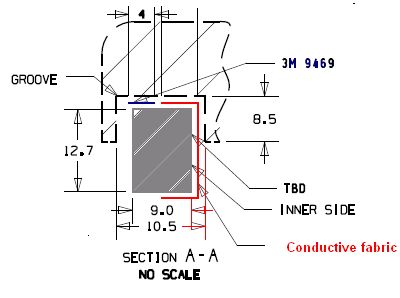 A conductive adhesive is used on the perimeter of the ITO coated side to attach and ground the film. Transparent silver coated PET film is also available. Applications include computer touch-screens, liquid crystal displays (LCD’s), transparent heaters and radiation shielding. An EMI paste can be dispensed onto conductive surfaces, such as an enclosure to form an EMI gasket. The surface of the electronic enclosure can be painted, plated, or metal. This dispensing process, utilizing a 3 axis robot, is ideal where the enclosure has narrow, complex or rounded surfaces, or contains miniature devices requiring a precision gasket. The solution protects the enclosure against internal and external radiated interference. 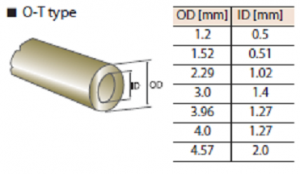 Form-in-Place is an ideal solution where the usual O-ring placement in a groove cannot be satisfactorily achieved. Nolato Silikonteknik is recognized worldwide as a leading innovator and developer of dispensed and extruded silicone products for the telecom, automotive, medical and security industries. Nolato’s Trishield® range of silicone elastomeric compounds offers conductive filler material options including silver, copper, nickel and graphite for the manufacture of electromagnetic interference gaskets in the unique Trishield® shape. The Trishield® technology includes benefits of lower compression force, shorter production time and lower cost materials. Pronat Industries is licensed to manufacture dispensed gaskets utilizing the unique Nolato Trishield® dispensing process. Knitted Wire Mesh with humidity or water seal are used to provide EMI/RFI protection to electronic cabinets, especially those mounted outdoors for exterior applications.